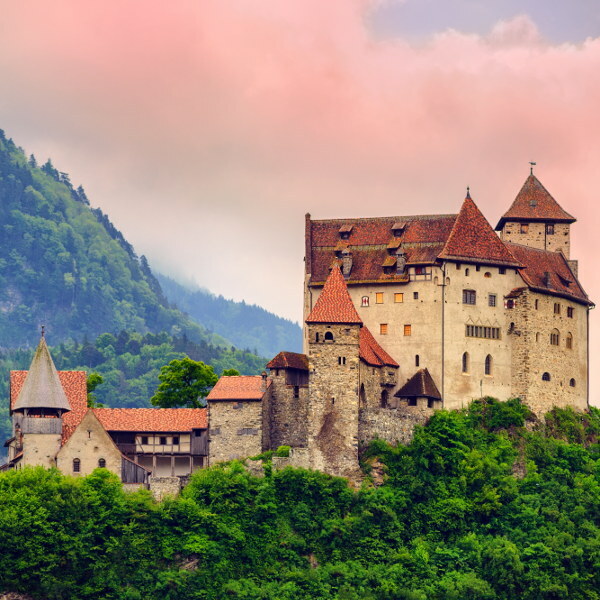 Liechtenstein is a tiny sliver of a country where enchanting medieval castles and old cobbled villages hide between soaring Alpine mountains and the legendary Rhine River. With a population of about 37,000 people, Liechtenstein is the third-smallest country in the world. Popular attractions include Vaduz Castle in Vaduz, Gutenberg Castle in Balzers, and the ski-resort village of Malbun. Get ready to explore magical castles and mystical mountains with cheap flights to Liechtenstein. The nearest airport to Liechtenstein is Zürich Airport. 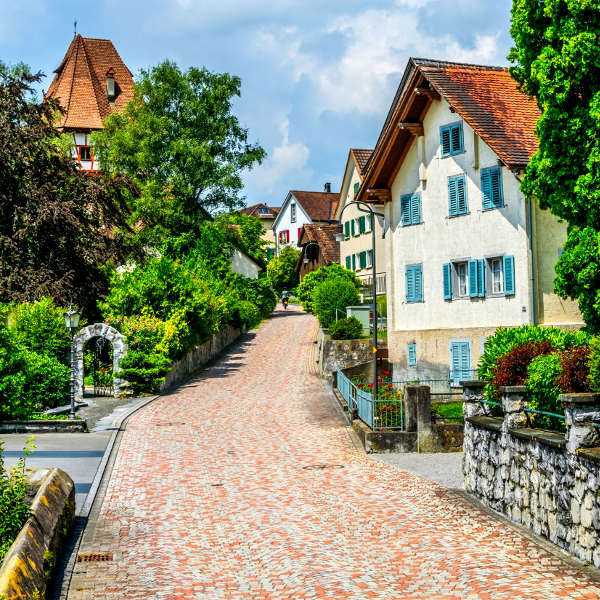 The villages of Liechtenstein are famous for their Alpine charm and picturesque settings. Vaduz is known for its street cafés and architecture, while Steg boasts timber homes and shimmering lakes. Liechtenstein is famous for its enchanting castles that sit atop green hills and are home to the royal family of Liechtenstein. The most popular of these are Vaduz Castle and Gutenberg Castle. 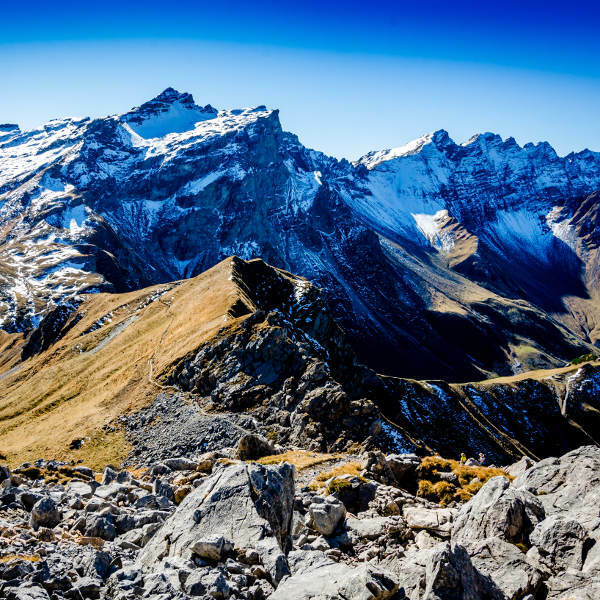 The mountains surrounding the eastern side of Liechtenstein offer a dazzling snow-capped backdrop and mesmerising hiking trails. And between its snowy peaks hides Malbun, a wonderland for winter sports. Liechtenstein experiences a temperate Alpine climate, with warm summers and mild snowy winters. Temperatures range from - 4 degrees Celsius in winter to 24 degrees Celsius in summer. If you want to witness the enchanting beauty of snowy landscapes and spirited atmosphere of the European festive season, the best time to visit is during winter (December to February). Alpine resorts bustle and the mountain slopes are at their prime for winter sports. Spring (March to May) is a great time to visit if you prefer warm weather and want to spend your days exploring the fairy tale castles and old villages. Summer (June to August) offers the best conditions for hiking and mountain climbing. For cheap flights to Liechtenstein, the best time to visit is between April and May, or September and October. It may be tiny (it is the sixth smallest country in the world) but what Liechtenstein lacks in size, it makes up for in beauty. Nestled between Austria and Switzerland, Liechtenstein is the only country lying entirely in the Alps, the highest and most extensive mountain range in Europe. Liechtenstein made its debut into society in 1712 and formed part of the Holy Roman Empire until 1806, when it became an independent principality. It is still ruled by a monarchy. Vaduz Castle is the official residence of Hans-Adam II, the reigning prince of Liechtenstein. But there is so much more to this tiny European country than thrones and castles. Liechtenstein is renowned for its excellent mountain hiking trails, interesting museums, and sensational skiing. With about 77 hiking trails lacing through the surrounding Alps, Liechtenstein is a paradise for outdoor enthusiasts and nature lovers. Some of the most spectacular trails include: Fürstin-Gina-Weg, Drei-Schwestern-Steig, and Fürstensteig. For culture lovers and art aficionados, Vaduz is home to a number of museums and galleries. The Liechtenstein State Art Gallery showcases a brilliant collection of contemporary artwork, while the Liechtenstein National Museum offers a fascinating glimpse into the history of the country. Note: Purchase an Adventure Pass to gain access to swimming pools, museums, and the public transport. Compare several airlines and book your cheap flights to Liechtenstein online at Travelstart! Liechtenstein is one of the safest countries in the world. The biggest concerns are icy roads during winter and speeding tickets. Speed limits are strictly enforced and fines are expensive, so it is advisable to keep within the limits. You should also ensure your routine vaccinations are up to date and obtain travel insurance to cover lost baggage, theft, and unexpected medical expenses.